A few people, especially this guy, have asked me when I was going to get around to making sprites of my characters. The problem is that I've tried but the results were horrible. The problem is that my early sprites of my characters look like shrunken version of my artwork, but even crappier than normal. Since I'm the main person that draw Twofold, I can only imagine him as I draw him and he's normally a bit less bulky than this sprite is. 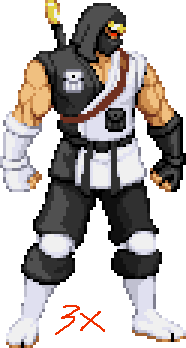 One of the reasons that I kept editing pre-existing sprites for so long was to build an automatic sense of the more dynamic proportions that you'd see mostly in the Capcom games, my personal favorites. Doing that seems to have paid off because this is the first Twofold sprite that I'm not too ashamed to show people. There will be more sprites of him in more dynamic poses but I needed this one to use as a guide for how to make the rest of his sprites. Things still need a bit of work but it still feels good to finally do this. About the progress animation: I'm not 100% that everything was done in this order but I saved copies of the part progress as separate layers. I was so tired by the time I got to spriting the head that I forgot to save any progress on it.